Ambitious and handsome, Joshua Andrews had always valued his life too much to take unnecessary risks. Then he laid eyes on the elegant picture of perfection that is Peter Kenyon. Soon to be promoted to captain, Peter Kenyon is the darling of the Bermuda garrison. With a string of successes behind him and a suitable bride lined up to share his future, Peter seems completely out of reach to Joshua. But when the two men are thrown together to serve during a long voyage under a sadistic commander with a mutinous crew, they discover unexpected friendship. As the tension on board their vessel heats up, the closeness they feel for one another intensifies and both officers find themselves unable to reign in their passion. Let yourself be transported back to a time when love between two men in the British Navy was punishable by death, and to a story about love, about honor, but most of all, about a Captain’s Surrender. Originally released by Linden Bay Romance, then by Samhain Publishing until Nov 2016, this classic of the genre is re-released in a third edition. Linden Bay Romance is proud to announce the winner of our 2007 Starlight Writing Contest. The contest, which was opened to previously unpublished authors from all over the world, was a pleasure to judge and we wish to thank everyone who entered. In reviewing the full manuscripts of our finalists, we discovered one that stood above the rest: Captain’s Surrender, written by Alex Beecroft. 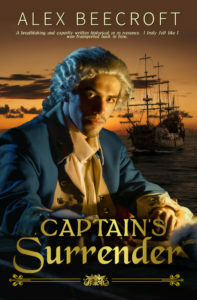 Captain’s Surrender a male/male historical novel set in 1779, is a beautifully written tale of forbidden romance between two star crossed lovers who are trying to survive life in the British Navy during the war with the Colonies. It’s filled with passion, intrigue, and the kind of compelling heroes that you’ve come to expect from a Linden Bay Romance novel–two of them, actually. The conflict in Captain’s Surrender and the forbidden nature of the romance between Josh and Peter is probably the strongest and most realistic that I’ve ever read. Ms. Beecroft has created a wonderful story based in the time of the great sailing ships… Thanks go to Ms. Beecroft for a very creative and fascinating look back in time.